Aston Villa made it eight wins in a row on Saturday after they beat Bristol City 2-1 at home to give themselves a five-point cushion over seventh in the race for the play-offs. Whilst the scoreline suggests a close game, the reality is that Dean Smith’s men should’ve won by a much wider margin. They were rampant from the first whistle and only a superb goalkeeping display from Max O’Leary kept the Robins in the contest. 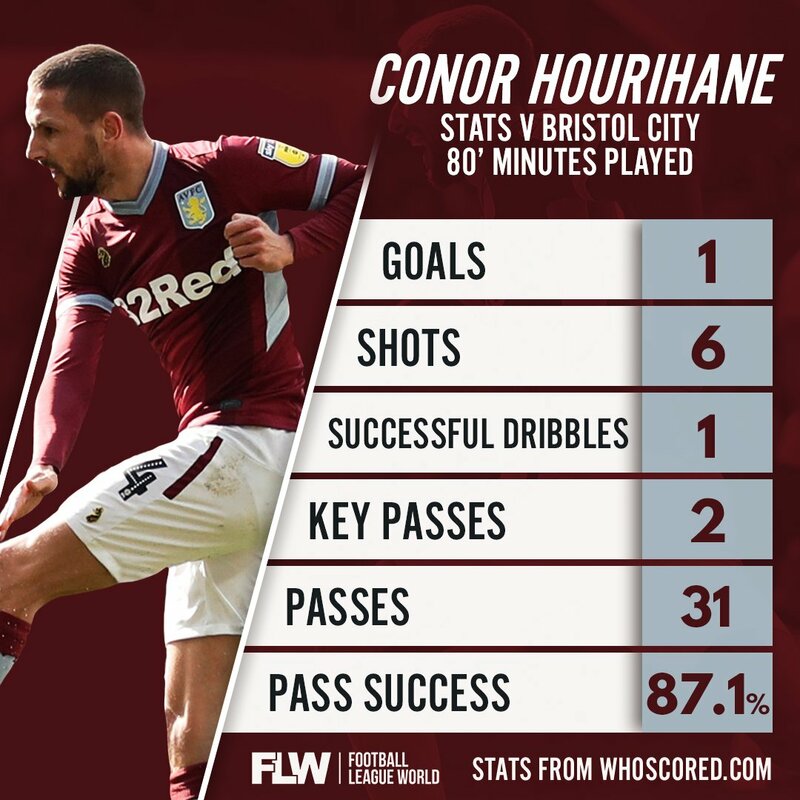 And, midfielder Conor Hourihane was key to Villa’s dominance, producing a fine display at the heart of the midfield that helped them run the game, as our graphic shows. The Irishman looked to get on the ball regularly and was very tidy in possession, although he didn’t just play it safe, with the two key passes highlighting how he can be progressive in his play. As well as that, with Jack Grealish absent through illness, he was given more license to get forward and he regularly found promising positions which saw him have six shots on goal. Only one of those went in, which turned out to be the winning goal in the 66th minute. That will have delighted the ex-Barnsley player who knows that he has to be at his best to keep his place in this side. Unfortunately for Hourihane, Grealish and fellow midfielder John McGinn are probably the best two players at the club, so they simply have to start. That means there’s only really one place up for grabs in the XI but Hourihane has shown with his performance against Bristol City that he should be given the shirt as Villa look to make it nine-in-a-row at Bolton on Friday.